We know that cost is an important factor when choosing a college or university. 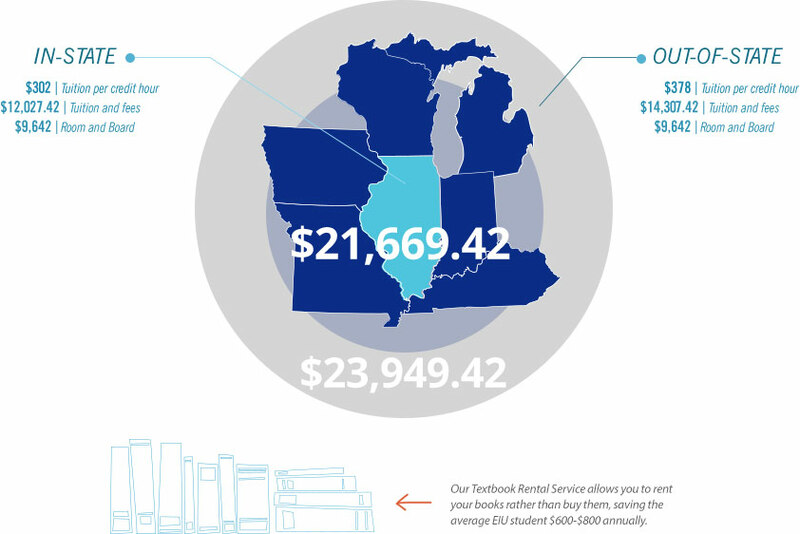 That’s why Eastern Illinois University works hard to keep tuition affordable. With that in mind, we are here to help. Our Office of Financial Aid and Scholarships will assist you in finding and applying for the right scholarships, grants, work-study jobs and/or loans. During the 2015-16 academic year, 80% of EIU students received financial aid, totaling $107 million. The average financial aid package was $13,582. If you’re beyond the reach of our neighbor states, but are a student with an exemplary academic record, you may qualify for the Distinguished Out-of-State Student Rate. A minimum 26 ACT composite (1230 new SAT combined score). A 3.50 cumulative grade point average on a 4.00 scale. Minimum of 15 college-level credits from an accredited college or university.